It's interesting how often I hear people talk about how much they love herbs, but then say they don't know what to do with them. A fun way to enjoy whatever you might be growing is to arrange a bouquet! Herbs are aromatic, so whether you use the foliage or the blooms, they will lend a lovely fragrance to any room in your home. The herbs can be cut stems or small pots can be tucked into a basket. and snuggled into napkin rings. 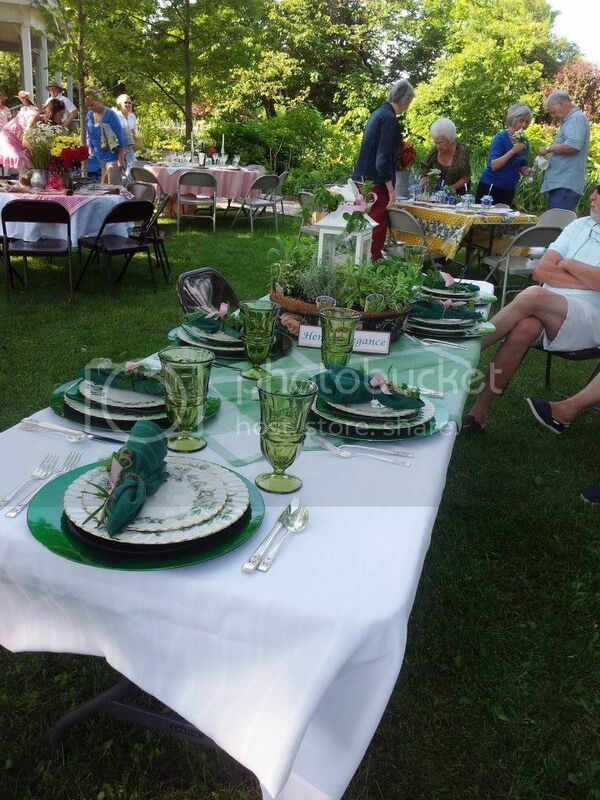 This photo was taken by Dawn Denton at a Master Gardener event. 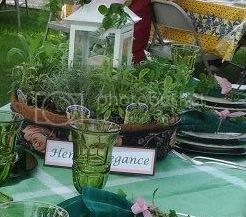 The Herbal Elegance table won the table scape competition at our annual picnic. Isn't it pretty? Are you curious about other simple ways to use herbs? Take a peek at my Recipes Page! If you are interested in growing herbs, there are quite a few tips on my Gardening Page! 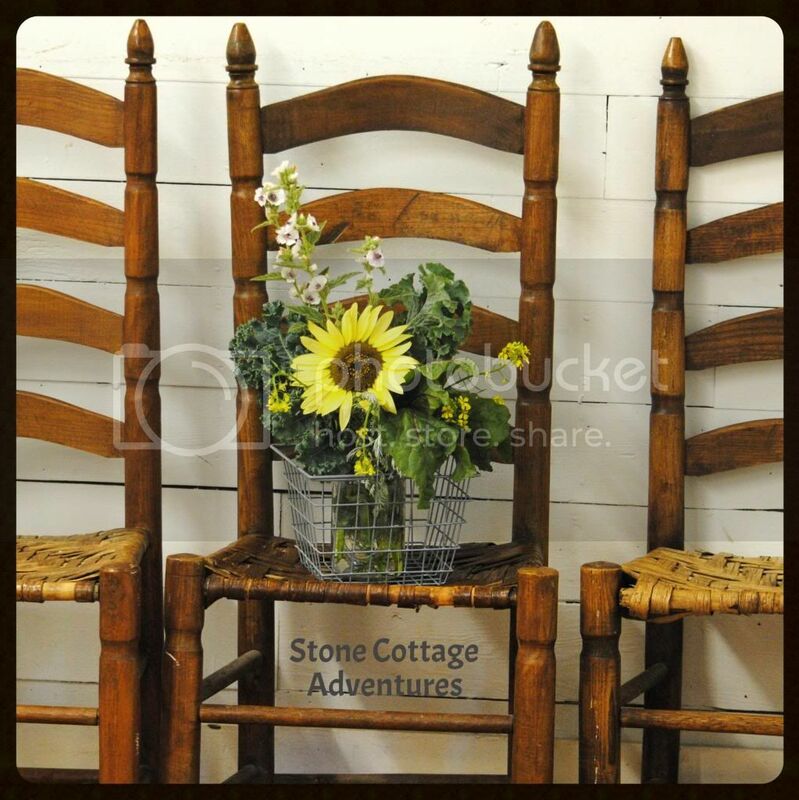 I'd love for you to visit my Stone Cottage each week as my little series continues. If you are new to herbs, I can give a place to begin! Everything looks so warm and welcoming! Thank you for linking to Super Sunday Sync! That's a great idea. What a great way to make a room smell wonderful through the use of an herb bouquet. Hope you have a great day. What a beautiful bouquet and tablescape! I had someone bring me a simple bouquet of herbs tied with a ribbon and I thought it was the loveliest thing! I use herbs all the time in cooking and to refresh the air in stale rooms, they work well. I like the idea of wrapping them in napkins and on a table display. Great idea - they are absolutely gorgeous! My husband recently brought me home a bouquet of flowers that had dill in them. Loved the look and the quirky, different smell they added! I appreciate the thoughtfulness of an herb bouquet so much...they are wonderful! My mood is always elevated by adding fresh herbs to my kitchen. In our food and in the freshness it brings to the air. Very super table, lovely bouquet. I've been learning about herbs and wild crafting with my kids. (I wrote a little about it in my Summer School post on my blog.) I'll have to check out your other posts on herbs. Thanks for sharing! I found your post through the Bewitch Me & Titi Link Party. I've pinned this. I'm learning about herbs and wild crafting with my kids. (I wrote a little about it on my blog post, Summer School.) I'll have to check out your other posts on herbs. Thank you for sharing! 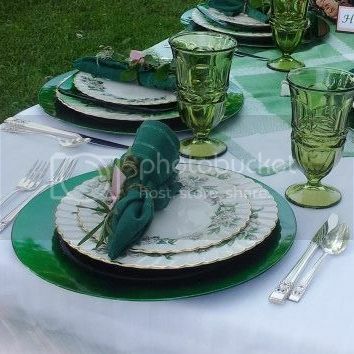 SO pretty and a great idea! Take it from one who currently has goldenrod I picked in the field next door in her kitchen in a bouquet, I'll use anything from outside that is pretty! I love the idea of using fresh herbs in bouquets, they smell great and are beautiful! I love our herb garden. There is nothing better than cutting them and bringing them inside. Thanks for sharing with us at #LOBS! I often cut mint and rosemary to go in with fresh cut flowers from our yard. What a great idea! I never would have thought of that! Thanks for linking up with Green Thumb Thursday! We'd love to have you back again this week!